Meagan’s Walk and Hug is a community event that welcomes participants of all ages and abilities. 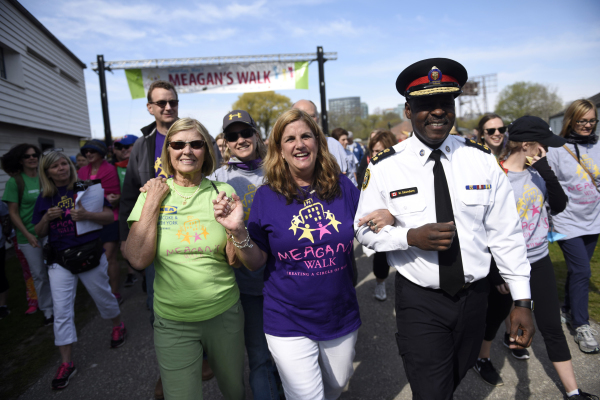 Meagan’s Walk and its supporters raise hope and awareness about paediatric brain tumours and has directed more than $5 million to much needed research at The Hospital for Sick Children. Register now online, set your fundraising goal, and start spreading the word, inviting friends, family and colleagues to participate with you, and ask them to support your fundraising efforts. Register early online by April 9th and take advantage of early bird registration fees. Sign up to receive the Meagan's Walk newsletter, for fundraising tips and updates. Every participant needs to register for Meagan’s Walk 2019. Please arrive on time to check in, hand in any offline donations, and to pick up your Meagan’s Walk 2019 participant wristband and t-shirt. It is never too late to register for Meagan’s Walk 2019. If you are registering on event day, ensure you arrive early and head straight to the onsite registration area. Parking will be available in the Fort York area, in public Green P lots and at Exhibition Place, at a cost per car. There is NO parking at the Fort York Visitor Centre. Fort York is a fully accessible National Historic Site. More details about where to park will be available closer to the day of the event. Please be sure to allow yourself enough time to park and walk to Fort York in order to sign in at the Participant Check-In. Meagan’s Walk encourages participants to take public transit. Check out the options at ttc.ca. By raising funds for research, Meagan’s Walk and its supporters help promote excellence in brain tumour research, and an understanding of how brain tumours work. This leads to discoveries that translate into improved care, treatments and outcomes for young brain tumour patients everywhere. Our steps are steps for research, steps towards finding answers. Everything we do and achieve at Meagan’s Walk is because we are united. Together we hug! Meagan’s Walk: Creating a Circle of Hope was founded by Denise Bebenek in 2001, the year she lost her cherished five-year-old daughter Meagan to a cancerous brain tumour. Leaving the hospital the last time without Meagan, Denise knew something had to be done and the mission that would become Meagan's Walk began. She channelled the outpouring of support and love received by her family and her own vision into what started as a spirited community walk and human hug around The Hospital for Sick Children in 2002. Since then, Meagan’s Walk has become a 365 day initiative to bring hope and awareness to this leading cause of cancer-related death in children and young people. Since its inception Meagan’s Walk has raised more than $5 million for ground-breaking research and is having global impact on the care of and outcomes for young brain tumour patients around the world.